The Leeds and Wakefield Social Work Teaching Partnership works to ensure Social Work students are given the skills and readiness needed for a rewarding and successful career in Social Work. As part of the partnership arrangement, you can study Social Work at either the University of Leeds or Leeds Beckett University. Both Universities have an excellent reputation in Social Work education and offer undergraduate and post-graduate Social Work Degrees. 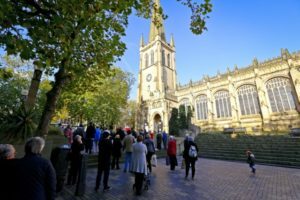 With a diverse demographic, a lively social and cultural scene, and excellent transport links to the rest of the UK Leeds and Wakefield are both great places to live, study and work. By joining one of our Universities you will gain real life work experience, as well as study the social work theories and research needed to begin your journey to become a successful Social Work professional. Study many subjects including psychosocial themes and perspectives, theories and policies relating to social welfare and the safeguarding of adults and children, physio-social influences on child development, decision making in practice, and social work perspectives in Mental Health. Be taught by both University lecturers, and practitioners, to ensure you get both the theoretical and practical learning you need. Undertake two social work placements, providing real-life work and statutory experience in a Local Authority setting, integrating your study with professional experience. Be supported by a highly skilled, qualified Practice Educator (a practising Social Worker) who will mentor, support and assess you during your placement. Experience a smooth transition from student to Newly Qualified Social Worker (NQSW) by undertaking the Assessed and Supported Year in Employment. Have access to excellent library services with dedicated librarians to give you expert advice in finding and using research in your learning and development.